The large and spacious land on which lies Trullo Capitolo, was partly planted with wine, fruit trees and vegetables. Everything is still harvested by the owners and if you wish, you may like to participate in the wine harvest, which usually takes place at the end of September. Gladly during your stay you can eat and use for cooking some of apples and vegetables – depending on the season you will find tomatoes, zucchini and pumpkins. For children the large land is ideal to play and rage. 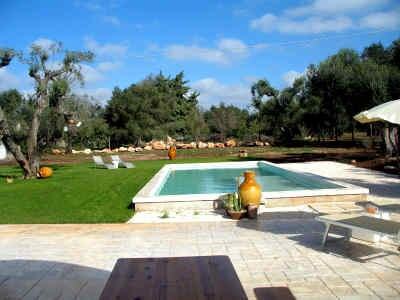 The very spacious Trullo, a typical old farmhouse, was completely restored and tastefully decorated by the owners and is therefore a special holiday home for 4 people. The terrace in front of the house runs through the entire length, where you can sun bathe and enjoy your meals outdoors. The sights, such as e.g. Alberobello (UNESCO World Heritage), Ostuni, Martina Franca, the Grotte di Castellano and the beautiful coastline with the marvelous beaches at Torre Canne are reachable by car.